Each leaf in this jewellery collection is hand-picked from a native tree or a bush. 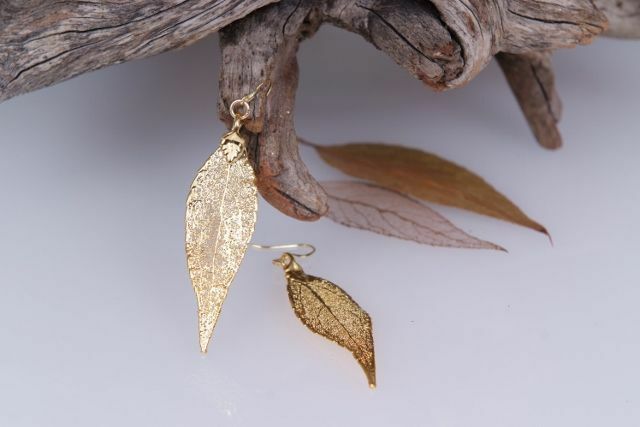 Each leaf is unique becomes a stunning earring after a careful and lengthy process which creates a hard metal shell around the leaf, encasing it forever. One of the 500 varieties of Australian Eucalyptus leaves, these lovely Real Leaf Earrings are hardened with copper and coated in high quality 22 carat gold. The hooks are surgical steel, nickel-free, and plated in 14ct gold. They are beautifully gift-packaged and include a story card. Matching leaf pendant available. No two leaves grown by Mother Nature are ever the same, so the leaf you get will be your own unique piece of Australia! It will be similar to the pendant photographed on the website, but it will have its own natural variations in shape and size.